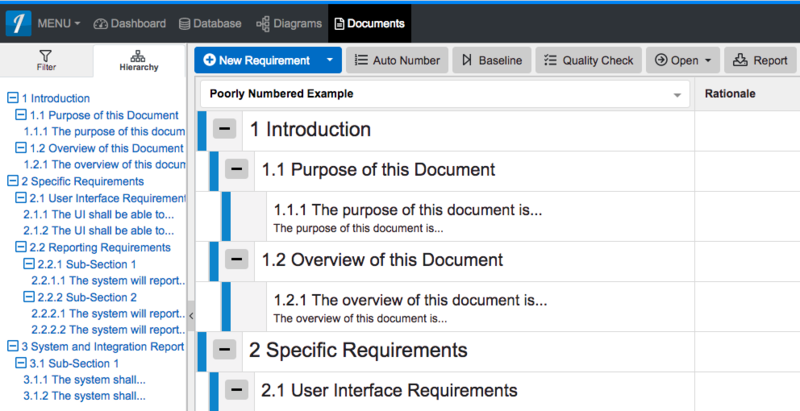 Within Innoslate, you have the ability to automatically renumber all of the document entities within a Requirements Document. The document used in this example was created to demonstrate that no matter how poorly numbered your document is, the 'Auto Number' function can re-number every document entity automatically based on hierarchical decomposition. Click on the 'Auto Number' button in the tool bar above your document. The 'Auto Number Document' panel will appear, where you will find the ability to add an optional prefix to your numbering. If you wish to add a prefix, do so here. When you are ready to re-number your document, click the 'Run' button. *Note: Depending on the size of your document, the 'Auto Number' function may take a few seconds to run. Once the 'Auto Number' function has finished running, your requirements document will refresh to display your newly re-numbered document. Within Innoslate, you have the ability to automatically renumber all of the document entities within a Requirements Document. The document used in this example was created to demonstrate that no matter how poorly numbered your document is, the ‘Auto Number’ function can re-number every document entity automatically based on hierarchical decomposition. Click on the ‘Auto Number’ button in the tool bar above your document. The ‘Auto Number Document’ panel will appear, where you will find the ability to add an optional prefix to your numbering. If you wish to add a prefix, do so here. When you are ready to re-number your document, click the ‘Run’ button. *Note: Depending on the size of your document, the ‘Auto Number’ function may take a few seconds to run. Once the ‘Auto Number’ function has finished running, your requirements document will refresh to display your newly re-numbered document.